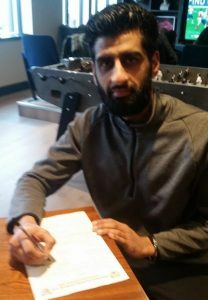 Gaz Singh – signing on the dotted line for Khalsa. Sporting Khalsa are delighted to welcome two new arrivals to the Aspray Arena. First, a warm welcome to striker Gurjit ‘Gaz’ Singh who has signed for the club today. A dynamic front-man with an excellent goalscoring record, he was a prolific scorer for Smethwick and Tipton Town before clinching a move into the full-time game with Kidderminster Harriers in the summer of 2015. During his time at Aggborough he did well at National League level before moving on to Hednesford Town and Redditch United prior to his arrival at Rushall. After a spell with Sutton Coldfield Town, he returned to Rushall this season. Secondly, Kieron Whittaker has joined from Wolverhampton Casuals. In 27 appearances for Cassies this season, the midfielder has bagged four goals as his side has pushed for promotion. Khalsa boss Ian Rowe said: “There’s a huge amount to play for this season and with football being what it is we can probably expect a twist or two yet. “So I’m really pleased to get Gaz and Kieron on board. Gaz has scored goals wherever he’s been and I suppose there’s a nice story behind him coming to play and hopefully score goals at a Sikh-owned football club. I expect it will be a popular one with them if he starts bagging the goals! Both players will be available for selection for Tuesday’s visit by Lye (kick off 7.45pm).